With excavation and planning done.. it is time to start the bottom steps. This is a big job and will be part of a bigger job – The Tank Level Wall – as well as being a huge step forward for us in regards to navigating the levels surrounding the house. 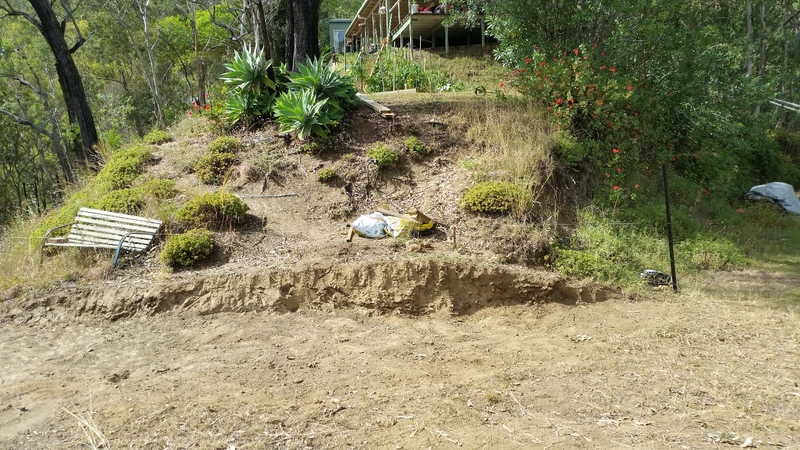 There will be x number of earth stairs coming down from the Plot Level, and these stairs will intersect with the path that goes around the large Narrow-leaved Ironbark. 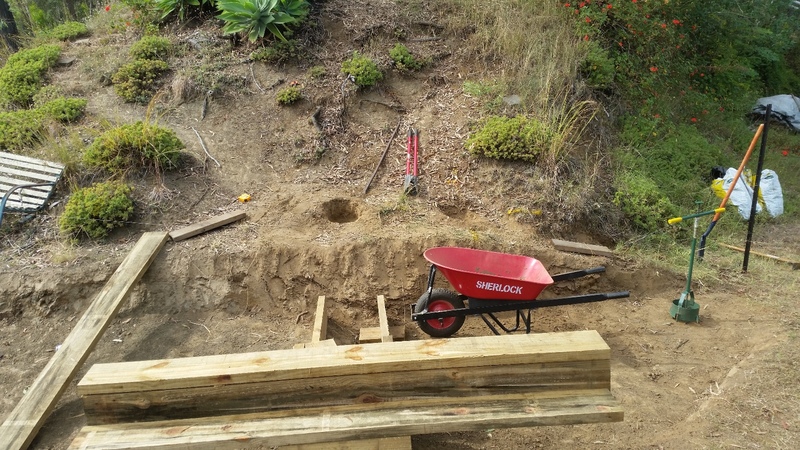 They will then connect to the retaining wall that will hold back the new gardens we create on either side of the earth stairs. There is a 1.5 metre deep hole there at the moment. There will be a landing at the bottom of the earth stairs and this will lead to 3 x 2.0 metre+ timber steps that will take you down to the Tank Level. But we have learnt a lot since we’ve been here and our ‘building’ skills have markedly improved. 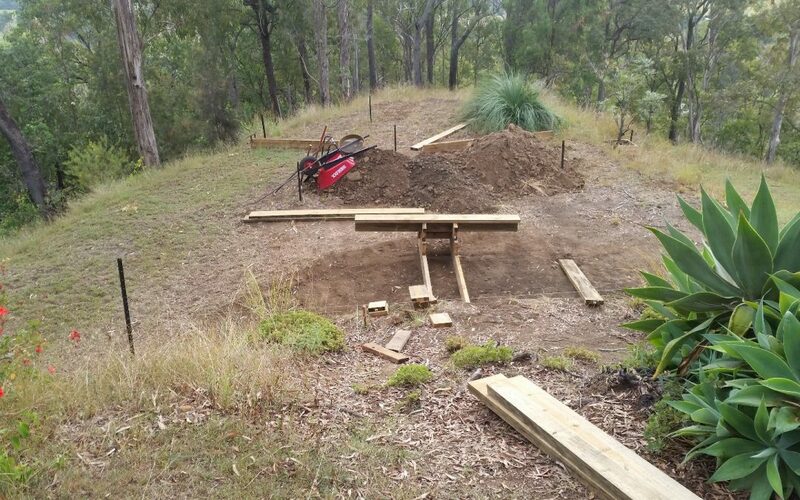 First job is to set and dig multiple post holes to support the various structures that will make up the steps. This was a job we knew would be hard, and hard it was. Just below the topsoil – most of which was missing already – was the hard compacted soil we call “brescia”. It is like rock and is very hard to get through. 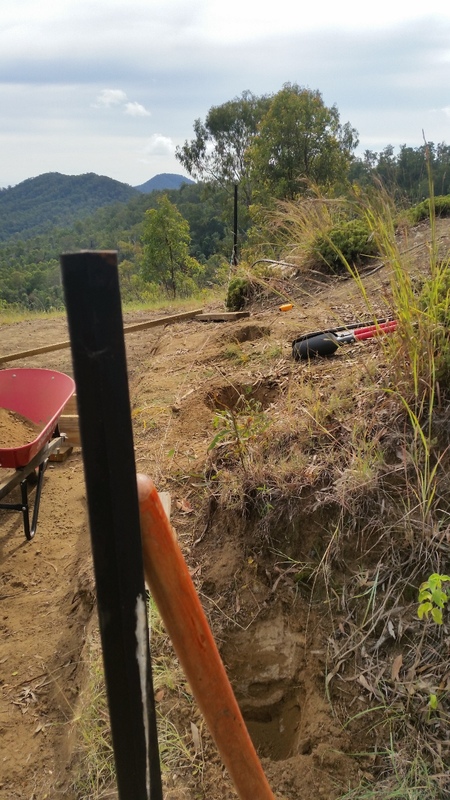 So doing the post holes was a difficult job to complete by hand and we had 9 post holes to do here.. and many more planned for future construction. After starting these post holes we realised we were going to need some machinery help so that we can create the post holes more efficiently. 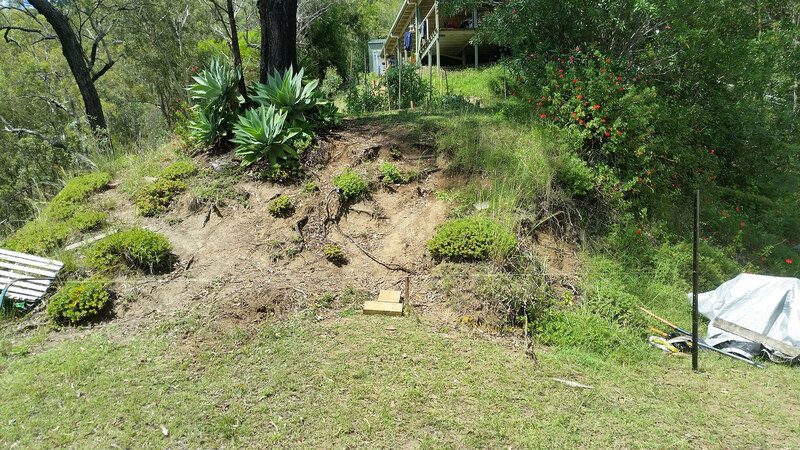 Working by hand with shovels and a crow bar is entirely workable… but these steps are also in one of the most exposed areas of the home hill and the bright Queensland sun can be very unforgiving when doing the hard yakka. It was time to investigate and purchase a hand-held Post Hole Digger.